Home EUROPE Right-wing populism on ascent: Is this end of centre in Europe? Both sides across the mighty Atlantic Ocean saw dramatic political developments in 2016. Conventional shells and normative frames of politics were broken and what came out has stunned political thinkers and public alike. Britain, a country known for its strong democratic Institutions received a great lesson as to why referendums ain’t sensible substitute for governance. Brexit became an infamous instance to be remembered for complacent government’s inability to stand against full throttle assault of populist forces. A ‘demagogue’ and avowed xenophobe became President of USA. His rise to the top cemented all those apprehensions that interpreted Brexit as ‘rise of right-wing’ populism and plummeting and rejection of liberal values in west. Interestingly, this wave of detestation is now a global phenomenon manifested in collapsing ratings of incumbent leaders worldwide. This daunting specter has done enormous damage to ‘political centre’ in Europe. Post-war European order is more vulnerable than ever with evident signs of dilution. Liberalism is retreating and populism is on the march. Rejection of constitutional reforms in Italy couldn’t have been possible, if it weren’t for Britain leading the march. Risk of contagion is greater than ever. Political discourse in Europe is coarse, hateful and apocalyptic in some sense. Once fringe, minuscule and political midgets are mainstream today. Europe has transformed into political hornet’s nest. Worse may come in 2017, when major European powers like France and Germany go for polls. In France, Marine Le Pen’s Front National, a far-right and otherwise neglected, marginal player led first round of regional elections; however, it couldn’t retain spectacular lead in the subsequent round. Marine is renowned for her malicious anti-immigration, anti-Islamic, anti-European stand and has been upping the ante by gnawingly marring discourse through her speeches thereby leaving little space for politically moderate. 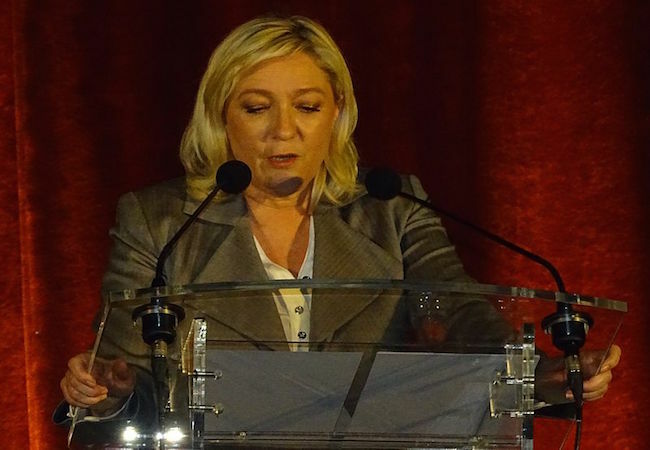 Sapping popularity of socialists in France, Trump’s victory in US elections and his “anti-establishment revolt” has made her a serious player in France’s politics now. Germany, like France, shows similar trend of right wing populist surge. A hailed lodestar of free world and the strongest advocate of immigration, German Chancellor Angela Merkel made her exhaustion, helplessness and corroding exuberance public when she wished to turn clock back and change her open door migrant policy , after receiving drubbing in Berlin elections. Alternative for Germany( AfD) a latecomer and small right-wing party has received significant support and been termed as possible contender against her. Political developments with a possible risk of causing social depredation have brought to the fore serious rumblings of brewing tornado. While centre was immersed in ‘will-o’-the wisp’ of its invincibility, the right wing populist parties gained significant ground in Europe. So, What has set downward spiral of centre in Europe? Why it seems out of sync? Why right-wing populists seem emboldened? What operable alternatives does centre have to counter such forces? There are stacks of factors explicating the populist surge like stagnant working and middle-class incomes; the feeling of being ‘left-out’ among those just managing to get by; the disruption of communities as a result of economic change; and resistance to the seemingly relentless forces of globalization: trade and immigration. However, the main strength of right-wing populism lies in taking extreme position on few issues and oscillating between traditionally fixed political arenas of left and right thereby making such schism considerably irrelevant or possibly ‘out of kilter’ under new circumstances. A revved up right-wing populist buffets comparatively moderate centre because centre presents itself as status-quoist, fairly complacent and out of touch from ground realities and too big for its boot to the degree that it either intendedly ignores anger, disappointment and woes or fails to sense any of them. Up against a lethal campaign of disinformation, hatred and varied kind of phobias, Centre tends to buckle under populist pressure and start dancing to their tunes. It smacks of ideological weariness and bankruptcy. Therefore, no wonder, recent trends lay bare suitability of ‘European Values’ that centre-left and centre-right have been trumpeting for so many decades. Growing strength of social media coupled with serious loss of trust in traditional modes of information has served populist agenda well. Whole globalization narrative is now a contested debate about begotten devastation of globalization. Disinformation flows more rapidly than cold Alpine winds having no barrier strong enough to halt such a flow. True that immigration brings a lot of concomitant problems like distributive conflicts and possible changes in composition of European population. However, disinformation ignores everything positive about such changes like new workforce, in addition to increased talent pool and cultural diversity. Hence, rules of objectivity don’t apply in populist campaign whereas liberal fact-checkers see facts being constantly run over. It’s necessary for centre to learn proper lessons from what’s transpiring in Europe and accordingly plan its counter against populist forces while aiming at its own resurrection simultaneously. Populism is not new, hatred is not new, a sustained campaign to muddy the waters in order to dwindle long-cherished beliefs and ideas is not new but context is new and times are different. Centre was never as enfeebled as it’s today. It needs to stand up against hatred, xenophobia and anti-European sentiments by perhaps crossing the rubicon. It needs to highlight and disseminate its positive agenda. It needs to stand for all the European values. It certainly requires to successfully keep ‘red-herrings’ out of political discourse and talk of real issues. It should also show signs of flexibility to open itself for unavoidable changes necessitated by changing times. In the words of Former British Prime Minister Tony Blair “The centre- particularly the progressive centre- wins when it has the initiative, when it is leading the debate, when the solutions it is putting forward are radical as well as sensible. Only a strong and revitalized centre can defeat the populist surge”. On the policy front, presumptuous attitude needs to be shunned and large influx of migrants must be handled efficiently by proper enforcement of security checks and laws without making people feel insecure. Social support policies for families must be framed and implemented as both conservatives and Europeans generally value them. Conservatives, forming major chunk of populist votes, don’t wish established institutions to be overthrown, therefore, distrust simmering against institutions has to be thinned out. Dwindling European economies give credence to genuine worries, therefore, governments have to have proper rejuvenation plans in place instead of falling prey to disconcerting populist demands. Present edgy times are defined by stripping away of illusions. Surety of centre’s invincibility was one such illusions. This era is characterized by crumbling of old institutions and values. Post-Berlin Europe may not ever be same again, if powers that be don’t mend their governing behavior and understand that right-wing populists are soaring up using democratic means and methods. Perhaps, pendulous reaction between appeasement and alarm has no significant space in European politics any longer. People have not rejected chances of peaceful Europe, but they have not been provided many. Hopefully , 2017 will show the path to better Europe and better world. Parikshit Khatana is a History Graduate from Hindu College, University of Delhi, India. BRICS: Does this multinational trade agreement jeopardize the future prosperity of North American markets?